André M. Carvalho is a member of the research team at OES participating on the ‘first global assessment on the current state of organizational excellence’ that was launched by the OETC and has been supported by the GBN, ISO/TC 176 and International Academy for Quality. He is a PhD Candidate of the MIT Portugal Program, working in a project that brings together the University of Minho, in Portugal, and the Massachusetts Institute of Technology, in the United States. His research project focuses in understanding how operational excellence programs, through an organizational culture change process, could promote organizational agility in order to adapt to new business environments. 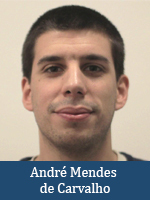 André holds a Masters’ Degree in Industrial Engineering and has working experience in the automotive and in the packaging industries, having had medium and long term academic and professional experiences in Portugal, Denmark, Brazil and Greece. He is the founder and current chair of the University of Minho - Portugal Student Branch of the American Society for Quality (ASQ).